Today is the start of Crumpet's Laid-Back 31 Day Challenge. I've been wanting to do one of these for a while, but I didn't know if I'd be able to stick it out with new nail art every day for a month. 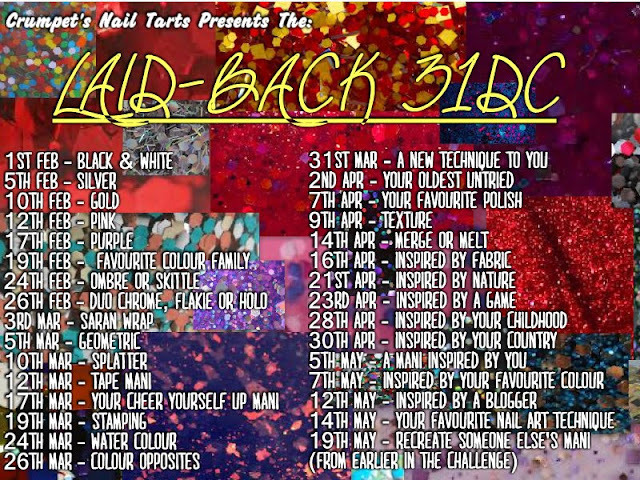 The laid back challenge requires just 2 manicures per week. Along with the Pokemon challenge I'm doing that will make 3 each week through the end of April. I'm going to try my hardest to stay on schedule. Wish me luck! I had a hard time deciding what to do until I had the idea to use the colors on top of my bare nails without a solid base. I just started doodling with a small brush and some dotting tools and this was the result. The thumb is my favorite design. It was the last nail I did and I almost regret not repainting all the others to match. It looks especially striking from a distance. You'll have to take my word though since all my pictures are close ups. I used Wet n Wild, Black Creme and Finger Paints, Paper Mache. It's all topped off with a coat of Seche Vite. Since today's theme is black and white, and since my kitty chose this particular photo shoot to wreck up my light box I thought this would be the perfect opportunity to introduce you. This is Styx the cat. 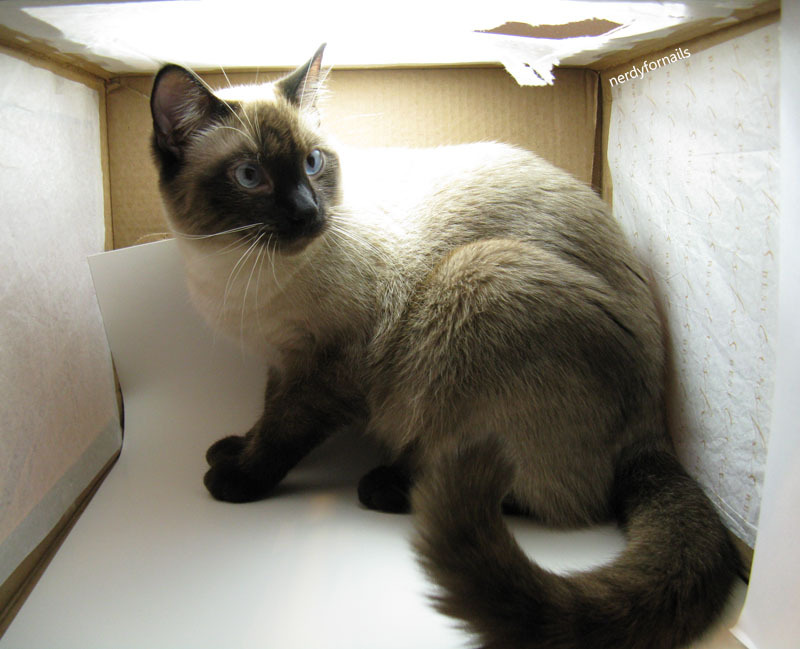 He's a one year old kitten at heart who thinks every box he encounters belongs to him. I got off easy with this little rip in the tissue at the top of my light box. Given the opportunity he would surely maul it into submission one mouthful of cardboard at a time. Here's what's in store for the next few months. Check back to see what I come up with and check out the links below to see what the other ladies are doing. wow! 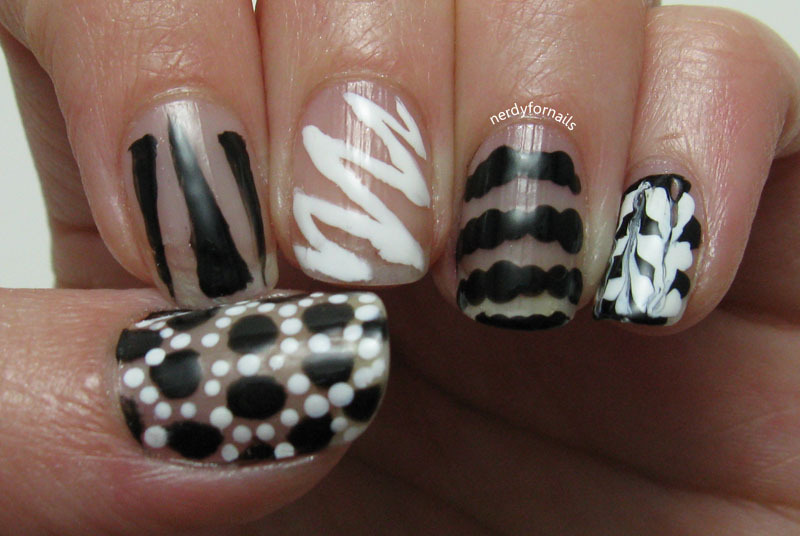 i love this mani and i see a lot more bloggers chose to do the laid back version of the challenge. lol good luck!